The fact that it was a 4-axle machine which was purchased in the end is due to the arguments presented by the TADANO sales force. 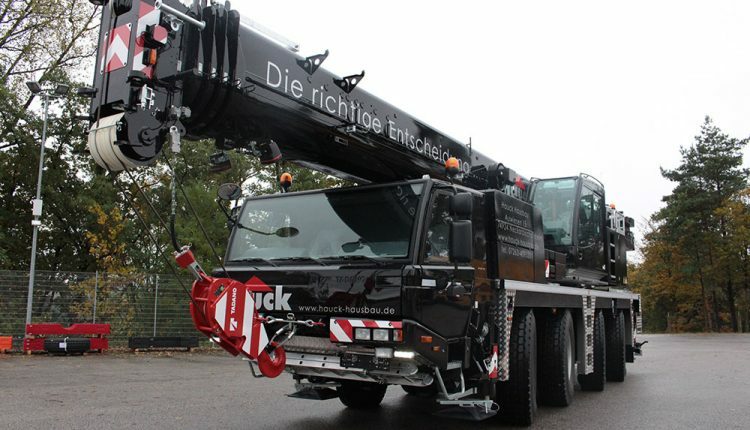 In addition to the ATF 70G-4’s transport weight, its high manoeuvrability was convincing which makes the taxi crane a multi-talent within Hauck Hausbau’s range of action, namely approximately 50 kilometers. Lauf / Pegnitz has proved to be the ideal working equipment. Hauck Hausbau has been providing people with homes of their own for over two decades. The family-owned company from Neckarbischofsheim identifies itself by its high quality standards which are reflected by application of innovative planning and manufacturing technologies in line with the high-quality materials used. The internally developed climate- and nature-sensitive building envelope with its healthy design which is open for diffusion and its optimum insulation ratings stands for the innovative power of the company.